Shepherd Chartered Surveyors and DM Hall have been appointed as joint agents to market licensed leisure premises in the heart of Aberdeen city centre for sale or lease. Available in part or whole, with premises licences still in place and with potential for a variety of alternative uses, the property is located within an established city centre leisure area within easy walking distance of Aberdeen railway and bus station and Union Street, the city’s primary shopping thoroughfare. 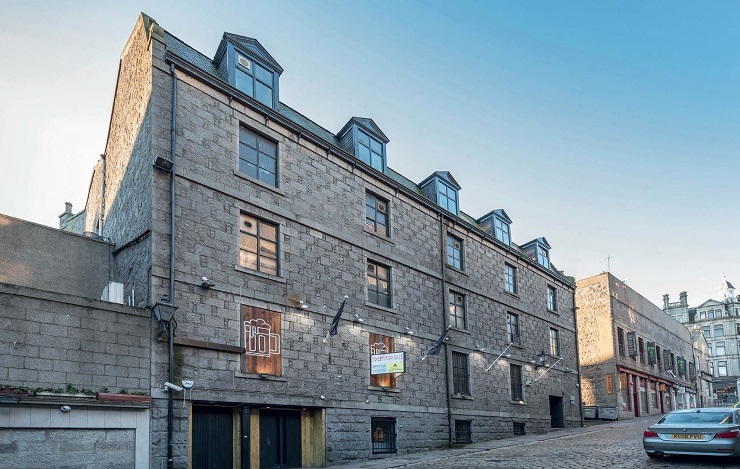 The 19,430 sq ft property at 17-19 Windmill Brae, with access from both Windmill Brae and Bridge Place, comprises leisure premises arranged over the lower ground floor, upper ground floor and part of the first floor of a substantial four storey and attic building. The lower ground floor bar, which formerly traded as Steinhaus comprises a bar area with fitted seating and a bar servery, male and female customer toilets, a commercial kitchen area and cellarage areas. The upper ground floor nightclub, which formerly traded as The Garage, comprises a dance floor area, seating area, bar servery areas, store rooms, with male and female customer toilets and a back of house office area at first floor level. The ground floor bar, which formerly traded as Traffic, latterly formed a VIP lounge for the nightclub and is fitted with seating areas, a bar servery and two unisex toilets. Offers over £575,000 are invited. Alternatively, the property is available to lease. Rental offers on application. For further information please contact the joint agents James Morrison on tel 01224 202800, Kevin Jackson on tel 01224 594172 or Gavin Anderson on tel 0141 332 8615.